The traditional enterprise, especially of large-size, normally adopts the so called "over-the-wall" approach to new product/service development. This means that "chunks" of the entire product development process are handled, in sequential fashion, by various department of the enterprise; and outputs/inputs are passed "over-the-wall" between departments, in a number of iterations that consume time, cost money and are seldom effective. Changes: to Documentation (Parts Lists, Drawings.. may have to be changed) - Tooling (Dies, Moulds, Jigs....) may have to be modified. Contracts with Suppliers may have to be renegotiated. Etc. Time impact: the entire time allocated to the Development process, already abundant, is normally exceeded. Effort: people energies go into "fixing problems" and "rectifying things", which leads to frustration and de-motivation. Lowered/Poor Customer Service: after the product/service is launched, both Marketing and After-Sales Service detect and record Customers' complaints on Product/Service Performance, which "normally" are reported back to Design and Manufacturing (Iteration). Inadequacies tend to perpetuate: the tendency is to develop new products with the same (low) levels of customer satisfaction, inadequate quality (at least in the initial stages of Product launch) and (high) cost. The most critical draw-back is the Time-to-Market factor, generally excessive. "..a product that is 6 months late to market will miss out 1/3 of the potential profit over the product's lifetime..."
Cost. Developing a product/service sequentially costs too much. As an extreme example ".. the cost of change for major electronics product in each phase of its development may increase tenfold from design to final production..."
In the new world, speed is a major key to competitiveness and performance. Launching a product or service quickly can mean the difference between getting "prime sales" as opposed to coming to market after competitors are already there and selling in a "mature sales" situation. World-class enterprises are aware of these critical issues, and rather adopt a concurrent or simultaneous approach to Product/Service development. In a modern version, Concurrent Engineering is the discipline to be adopted to eliminate all inadequacies associated with the traditional "over-the-wall" approach. 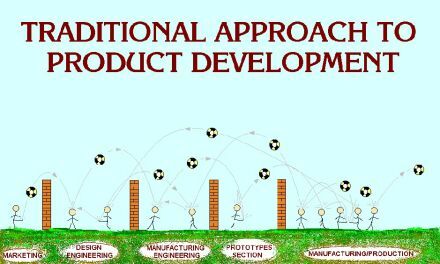 Method to create successful new products/services by bringing together as early as possible in the design cycle an enterprise's resources and its experience in design, development, marketing, manufacturing, service and sales. These capabilities are then focused on developing and manufacturing a high-quality, lowest-cost product or service that meets the customer's needs. All the steps along the development way are handled in parallel. Multi-skill/multi-function Team members from various functions of the enterprise (Marketing, Engineering, R&D, Manufacturing, Sales, Service, Quality, Procurement....) working in integrated/parallel fashion in the product/service development process (as opposed to the traditional single-skill/single-function, specialised/fragmented "over-the-wall" approach, Adam Smith style). Product/Service Development seen as a flowing, parallel process, not as a number of steps in sequence. The processes that are required to produce and service the new product or output the new service are designed at the same time that the product/service itself is being designed. Each expert ensures that the problems that could later occur in his department are, to the greatest extent possible, avoided, thereby reducing dramatically later changes. The product development team can rapidly verify multiple options. This results in an "optimal" design solution. The CE approach brings a number of benefits, including: reducing the development time by 30% - 70% - fewer/nil engineering changes - reducing time to market by up to 90% - quality improvements of up to 600%. However, Parallel Engineering is simultaneous and, consequently, more complex. As such, it requires considerable attention and planning. It is generally easier to manage a "concurrent" development process in the SME than in the larger-size enterprise. In all cases, the product/service development team MUST be co-ordinated following strict Project Management rules (more »).